In 1988, Rick Roethke founded Barrington Investment Company, LLC and Barrington Management Company, Inc. Formerly, he served as President of the Sycamore Group, one of the largest real estate investment and brokerage companies in the Midwest. Mr. Roethke was also founder and past President of Dominion Reality, Inc and Director of Real Estate for Cloverleaf Development Company, an affiliate of Dominion, which is one of the largest apartment developers in the country. During the Savings and Loan Crisis, he was responsible for the work out of bank owned commercial assets and the repositioning of the balance sheet for Union Federal Savings and Loan, the largest S & L in Indiana. 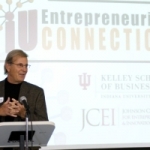 Mr. Roethke holds an undergraduate degree in Business from the Kelley School of Business at Indiana University and also has a masters degree in business. Avocationally, he has been deeply involved for over 30 years as an adjunct professor and in an advisory board capacity to various university business schools throughout the United States. Glen James joined Barrington Management Company in 2003 as Vice President of Operations. In 2009, he was named President of the company, where he oversees the operational, financial, accounting, and administrative affairs of the company and provides consultative advice to Barrington Investment Company for its acquisition, disposition, redevelopment, and repositioning of Barrington properties. Formerly, Mr. James served as Regional Vice President for both general and retail operations for the Midwest division of Champion Enterprises, one of the largest Manufactured Housing companies in the country. He is a Certified Property Manager (CPM), accredited with the National Institute of Real Estate Management. He is a member of the National Communities Council (NCC) and the Indiana and Kentucky Manufactured Housing Associations. He has also served on numerous committees including PAC, finance, legal, compliance, and media for the Nation Communities Council. Glen is also a commissioned Kentucky Colonel. Barrington Investment Company was founded by Rick Roethke in 1988 as a boutique real estate investment company for the purpose of providing significant returns for our core group of investors, while providing an engaging and enjoyable work environment for our employees. Investors have enjoyed substantial profits though our innovative and visionary real estate investments and tax-advantaged exchanges. We specialize in sophisticated value-added real estate investments and development, including investing and adaptively redeveloping mobile home parks in the Midwest and Southwest. We are also skilled and active in apartments, retail, industrial, build to suit transactions, as well as investment using non traditional self-directed IRAs. Barrington is privately held and is headquartered in Indianapolis, Indiana, with an office in San Diego, California. Please visit our contact us page for information on our office locations. Leading the industry since 1988. Barrington provides significant returns for our investors, while providing an engaging and enjoyable work environment for our employees.